The apricots & pistachio stuffed roulade is our personal favorite! 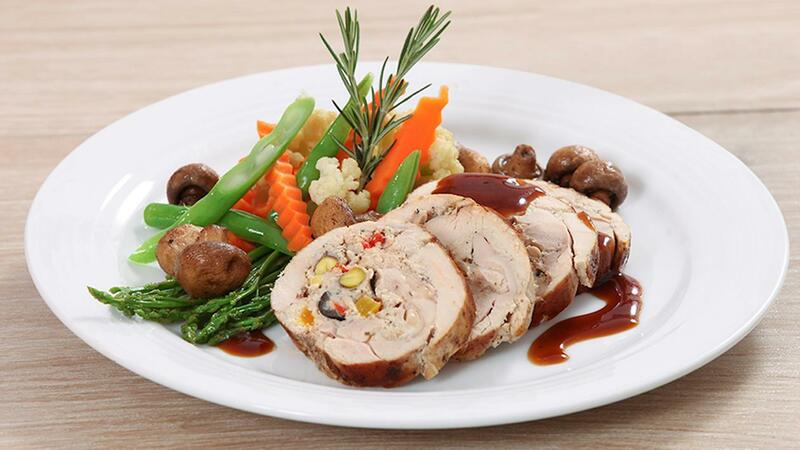 We highly recommend Knorr chicken seasoning powder, which will boost the real poultry flavor of the Roulade. Try this short-cut recipe for the easiest festive feast ever! Boneless and flatten the turkey breast into ½ inch thickness; seasoned with orange, bee honey and ¾ of Knorr Chicken Seasoning Powder. In a separate bowl , mix mince turkey with all the remaining ingredients; remaining Knorr Chicken Seasoning Powder, and chilled it for few minutes. Roll up the beast by keeping the filling in the middle and rap it and threading tightly. Place the chicken roulade on a greased baking tray and bake it in the oven for about 1 hour or till done. Once the turkey is cooked; rest it for 30 minutes and gently slice into 5cm thick slices and served with orange and sundried tomato reduction and accompaniments.